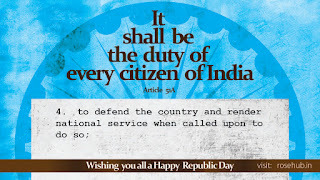 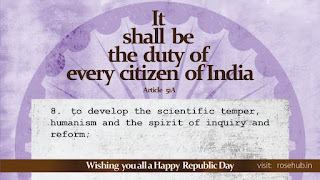 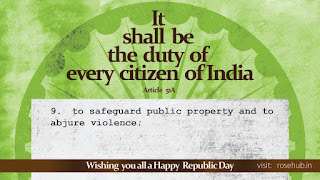 All the time we talks about our constitutional rights; lets know our duty too. 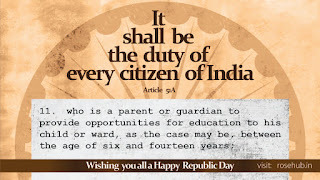 The Fundamental Duties of citizens were added to the Constitution by the 42nd Amendment in 1976, upon the recommendations of the Swaran Singh Committee that was constituted by the government earlier that year. Originally ten in number, the Fundamental Duties were increased to eleven by the 86th Amendment in 2002, which added a duty on every parent or guardian to ensure that their child or ward was provided opportunities for education between the ages of six and fourteen years. The other Fundamental Duties obligate all citizens to respect the national symbols of India, including the Constitution, to cherish its heritage, preserve its composite culture and assist in its defence. They also obligate all Indians to promote the spirit of common brotherhood, protect the environment and public property, develop scientific temper, abjure violence, and strive towards excellence in all spheres of life. Citizens are morally obligated by the Constitution to perform these duties. However, like the Directive Principles, these are non-justifiable, without any legal sanction in case of their violation or non-compliance. There is reference to such duties in international instruments such as the Universal Declaration of Human Rights and International Covenant on Civil and Political Rights, and Article 51A brings the Indian Constitution into conformity with these treaties.